One of my New Year’s resolutions this year was to “do something random.” Usually, having a resolution this vague doesn’t result in anything, but I had proclaimed back on New Year’s Eve that this year would be about taking risks, doing random things, and maybe even “leaning in.” In February, I attended the Intercollegiate Taiwanese American Students Association (ITASA) 20th Anniversary Alumni Reunion in New York City. I had been involved with ITASA—a non-profit dedicated to connecting the collegiate Taiwanese American community—when I was an undergrad at Georgetown. Those couple of days inspired me to want to find a way to give back to ITASA. That’s when I thought of The Taiwan Necklace Project. 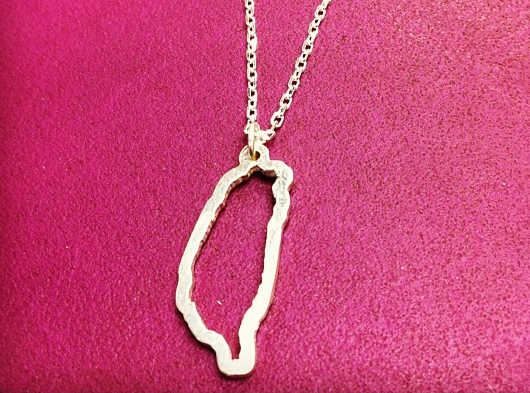 I have a colleague who wears a necklace of her home state. I wanted to get a similar necklace of Taiwan, but after a few searches, I realized it didn’t exist. Have you ever had a great idea but didn’t act on it because it wasn’t your area of expertise? I will admit when I first started thinking about this, I didn’t know anything about how custom jewelry was made. Many of my attempts to search for jewelry manufacturers turned up DIY jewelry-making sites instead. After getting a bit creative, I found a list of New York-based jewelry manufacturers and contacted them all. “I’m Taiwanese, and I’m looking to make a necklace of the outline of Taiwan as a fundraising project for ITASA,” I explained over the phone. “Wow, I’m Taiwanese too.” Shannon of Shiang New York was on the other line. When we met in person, she walked me through how she makes her jewelry and showed me different samples while I attempted to follow along. About two weeks later, the sample was ready and we met in the Diamond District to pick out the perfect chain. And that’s where we are today. I’m accepting pre-orders until April 21 and hope to be able to donate to ITASA in May. For more information, check out The Taiwan Necklace Project. So when I say, “Do something random,” I guess I mean, “Do something you didn’t think you would do.” For me, it was seeing my idea for a necklace get produced (and even becoming a blogger at Mochi Magazine). What about you? Have you done anything random this year? And how are your New Year’s resolutions coming along?